Posted on Saturday, December 14th, 2013, by Brenda Pottinger under Misc..
Are you still looking for the perfect holiday gift for someone special? Give her the gift of beautiful memories. Or if you know you want to book a session next year and you want extra photos to hang on your walls – this is a great deal for you! 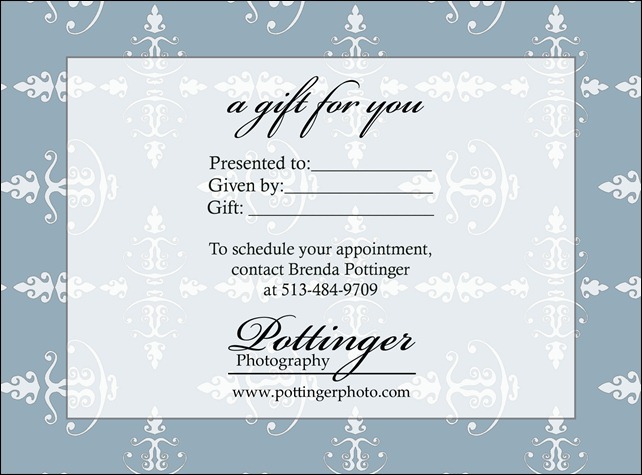 With every portrait gift certificate purchased you will receive a $25 print credit. * The sale ends December 17th. *$25 print credit must be used before 10.1.14 and may not be combined with other discounts or promotions. Thank you for supporting our livelihood.